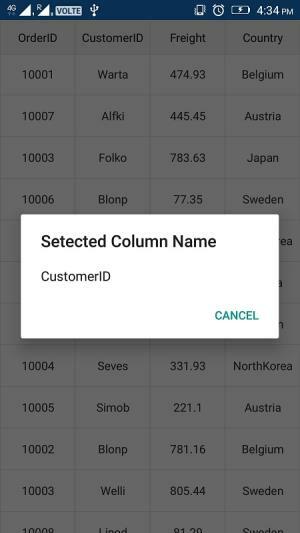 How to get the column name on tapping a row in SfDataGrid? You can get the column name while tapping a row by using the SfDataGrid.GridTapped event. It provides the row column index in its argument. Thus, using the ColumnIndex you can get the column name of the tapped cell in SfDataGrid. Refer the below code example in which the GridTapped event is hooked in SfDataGrid. The below code illustrates how to get the Column name of the tapped cell using the ColumnIndex obtained from the GridTapped event arguments and show it in a DisplayAlert. On executing the above code and tapping a cell in SfDataGrid, a DisplayAlert will be display the column Name as shown below. How to get the column name of the selected row?